That’s how Riverhead Republican committee leader Mason Haas explained why he believes Riverhead Town Board members, all Republicans, need to meet in twice-monthly political caucus meetings — which are closed to the public. Town Supervisor Sean Walter says he stopped attending the meetings in January and believes other Town Board members are using them to illegally discuss public issues behind closed doors. But the Republican chairman and the executive director of the state’s open government committee say the meetings are legal — under certain conditions. He pointed to a recent decision by a majority of the Town Board — unofficially, as there was no formal vote — to back away from a plan to move the town animal shelter to the Henry Pfeifer Community Center in Calverton. He said he believed board members had all been on the same page on that issue until a caucus two weeks ago. “We’ve been working on this for a long time and for the most part, the majority of the board agreed,” Mr. Walter said. Since he’s stopped attending caucuses, however, the supervisor says several discussions in Town Hall — and outside it — have not gone his way. He believes the board majority’s recent change of opinion on plans to convert the armory into a police headquarters and justice court and to sell the Second Street firehouse, also developed during caucus meetings. The supervisor said he first heard about the firehouse sale reversal from a News-Review reporter and later chastised Town Board members for going to the press before speaking to him. At last week’s public work session at Town Hall, Mr. Walter tried to combat the caucuses by laying out a “vision for the town” (see related story, page 3). Using several pieces of white paper taped to a wall, he listed a number of “problems,” “options,” “solutions” and “goals” — and spoke about how the board can work together to improve the town. The supervisor also alleges that Mr. Haas has been trying to convince council members not to support term limits, a topic they discussed at a recent work session and appeared to support, at least for Town Board positions. Mr. Haas declined comment on that allegation. But he says the Republican board members are not discussing public business — including the topics Mr. Walter has brought up — at the caucus meetings. He says they discuss only the political ramifications of public issues — not the issues themselves. 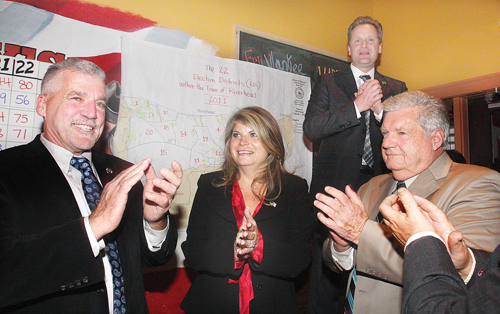 Riverhead GOP Chair Mason Haas (left), Councilwoman Jodi Giglio, Supervisor SEan Walter (back) and Councilman John Dunleavy on Election Night last year. In fact, New York State’s Open Meetings Law clearly exempts caucuses, based on a 1985 addition that was made because politicians at the state level felt that by discussing public business in public they would be revealing their political strategy to opponents, according to Mr. Freeman. However, a 1992 court case — in which the Buffalo News sued Buffalo city council members, claiming they were violating that law by discussing the city’s budget crisis in a caucus — did establish a precedent that placed some restrictions on what can be discussed at caucuses, Mr. Freeman said. In that case, the judge ruled that a legislative body cannot discuss public issues in caucus meetings when all its members are of the same party. If a board has just one member of a different political party from the others, the board majority can discuss anything they want in a closed-door caucus, Mr. Freeman said. “This case indicated that when all of the members of a legislative body are from the same party, they can only hold closed caucuses to discuss political party business. They can not do so when they are discussing public business,” he said. By getting the “attacks on one another” out of the way in the caucuses, Mr. Haas said, board members can focus on town business at board meetings. Mr. Dunleavy said Mr. Haas has not pressured the board to oppose term limits, but rather that he changed his opinion on the issue after hearing from the public. He feels the voters handle term limits themselves, rarely electing a Town Board member for a long time. Councilman George Gabrielsen feels the board needs only one caucus per month, not two. He declined to comment on what is said at caucus meetings. Former Republican chairman John Galla, now a legislative aide for Assemblyman Anthony Palumbo, said Tuesday night that he wished he’d held more caucuses as a party leader. He estimated that in his 17 months as chair, he held no more than 10. Mr. Galla echoed the current chairman, saying that discussion of public matters never came up. Mr. Wooten said the caucus meetings usually involve board members, Mr. Haas and sometimes some GOP committee members. “I don’t think we’re doing anything illegal, nor would I partake in it if it was illegal,” said Mr. Wooten, adding that he would walk out of the meeting if he felt public business was being discussed in a caucus. Mr. Freeman said that in the state Legislature, most of the public business is discussed in caucus meetings of both the majority party and the minority party of the Senate or Assembly. Supervisor Walter, however, feels Riverhead has not benefitted from the closed meetings. Mr. Walter fears the board will eventually pull its support for the ongoing subdivision plan for the Enterprise Park at Calverton, where an environmental study of the plan is taking about two months longer than expected. The state Open Meetings Law and opinions of the state committee on open government rarely impose any sanctions or consequences, other than public embarrassment, unless they are used in filing a lawsuit.